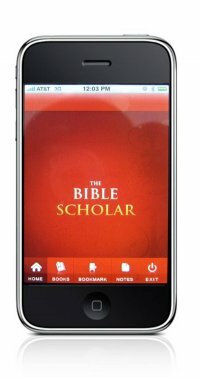 The Bible Scholar announced today that it has introduced The Bible Scholar App for iPhone and iPod touch, making it easier for all Christians with busy schedules to finally have access to a vast library of scholarly tools without going to a Bible College. A deep knowledge of the Scriptures and an understanding of the history of the Christian Church are essential to the foundation of every Christian. For so long it has been a big challenge to gain access to a historical account of Christianity with ease without attending a Bible College. Hence, individuals on the go with busy schedules could not fully participate in this quest without radically changing their schedules. To gain this knowledge required attaining a massive library costing hundreds, even thousands of dollars. The Bible Scholar App for iPhone is the first and only app for the iPhone and iPod touch that successfully provides an in depth account of the Church’s origin by shedding light on the age of the Apostles, Medieval Christianity, Christianity in the Middle Ages, and explores The German and Swiss reformations. Now any serious student of the Bible can access this information with a simple tap on his or her iPhone or iPod touch. Considering the wealth of information in this app, it is amazing to know that this app is available on the iTunes App Store for just $6.99. Additionally, it has two Bible dictionaries, eight separate Bible commentaries, The Institutes of the Christian Religion by John Calvin, eight volumes of Church history, and much more. This app contains more than 14,000 pages of Bible study gems. Users of this app can copy and paste the content into emails and transfer to a desktop or laptop and incorporate it into study notes, sermons, articles, research papers or just to share with a friend. 1. Books: The app has more than 20 volumes of Bible dictionaries, Church history, and Bible commentaries. 2. Bookmarks: This feature ensures that the user never loses his place. 3. 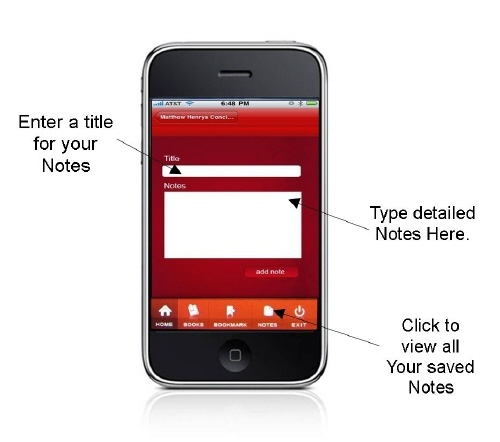 Notes: The user can make and save his notes for future reference. 4. A multicolor table of content: This attractive table of content makes navigation easy with scroll functionality. 5. Page elongation: A user can tap on a book from the table of contents, and select a desired chapter. Once within the book, he can tap on the sub-header within the book to elongate the screen. 6. Font size: A user can adjust the font size by using the font adjuster or by simply pinching the screen. 7. Copy and paste: The user can copy and paste into documents, emails, and research papers etc. In this premier value rich Bible-based iPhone App, the developers have included more than 20 volumes (with more than 14,000 Pages) of wonderful Bible study tools that answer all the questions a person could have about the Holy Scriptures. This 803-page dictionary covers every Bible word from A to Z. This commentary has more than 1,000 pages of in-depth commentary on the Holy Bible from Genesis to Revelation by a noted scholar. This four volume in one classic by John Calvin covers the basic doctrines of Christianity and theology. It has more than nine hundred pages. This amazing topical Bible has verses arranged by topics. This 869-page manual is necessary for any serious Bible student or teacher. This commentary covers the entire New Testament. This famous 797-page work by B.W. Johnson is an outstanding companion to anyone who wants to know more about the Bible. William Smith's classic dictionary will help the reader to clarify the meaning of Biblical words and names. It has more than eight hundred pages. This six-volume collection of commentaries on the Psalms of David is the crown of Charles Spurgeon's work. It has 4,778 pages. Lewis Berkhof's famous introduction will help the student to understand the history, culture, and authorship of the New Testament books of the Bible. It has more than two hundred pages. Updated King James Version of the Holy Bible. This contains more than 1800 pages. It would be beneficial at this point to look at how to use The Bible Scholar App. A good example to look at is Matthew Henry’s Bible Commentary. A person simply taps on Matthew Henry on the iPhone screen and it opens up to a list of all the books of the Bible from Genesis to Revelation. If he taps on Genesis for instance, the book will load to Matthew Henry’s commentary on the entire book of Genesis. He will get a verse-by-verse commentary by the author and get to know where the name Genesis originated. The same applies for every other book within this great book. Another great aspect of this app is that the fonts are so readable; the reader does not need reading glasses. One feature that proves to be quite useful is the bookmark feature. A person can bookmark sections in the books he is reading, so he never loses his place. Therefore, if he is interrupted, he can come back and return to what he was reading. One of the wonderful features that any student of the Bible would appreciate is the notes feature. Here one can write pages of notes and thoughts on what he is studying. The user can even title his notes for easy reference. The user could do this on the entire books within the app, including the Updated King James Bible. A person can read a passage of scripture, write study notes, and save them for future reference. The app is easy to load. This is very exciting to know because one does not have to wait for a long time to gain access. 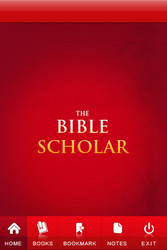 He simply taps on The Bible Scholar’s icon and is ready to begin enjoying the wealth of information within each page. This is arguably the most comprehensive Bible related app on the iTunes App Store. Every Christian or student of history will find this app to be worth the investment. The Bible Scholar was designed to empower the believer to understand the Scriptures through innovative tools, Bible commentaries, Bible dictionaries, and Church history; thus providing a firm foundation that will stand the test of time. 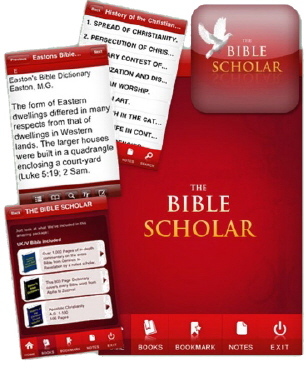 The Bible Scholar App for iPhone Snapshot of Content of The Bible Scholar App for iPhoneThis user friendly App has more than 20 volumes of Bible dictionaries, Church history, and Bible commentaries. The Books are listed on the menu. Take lots of Notes and Bookmark PagesThe Bible Scholar App for iPhone allows the user to take lots of notes and bookmark several pages Church History, Bible Commentaries, and DictionariesIn this premier value rich Bible iPhone App, the developers have hand-picked over 20 volumes (with more than 14,000 pages) of wonderful Bible study tools that answer all the questions a person could have about the Holy Scriptures.